Medulloblastomas are the most common primary malignant brain tumors in children, accounting for as many as 30 percent of all solid brain tumors — as well as rarer tumors, such as neuroblastomas, pineoblastomas, and retinoblastomas. A type of primitive neuroectodermal tumor (PNET), medulloblastomas occur near the base of the skull and can spread to the spine or to other parts of the body. They are thought to arise from primitive (undifferentiated) nerve cells left over from the gestational development of the nervous system. Because the tumors are malignant, they tend to spread easily through the cerebrospinal fluid (CSF) that bathes the brain and spinal cord. In rare cases, the tumors may spread beyond the central nervous system. Diagnosis begins with a physical examination and history. As with other brain tumors, imaging studies are the key component in the diagnosis of medulloblastomas. 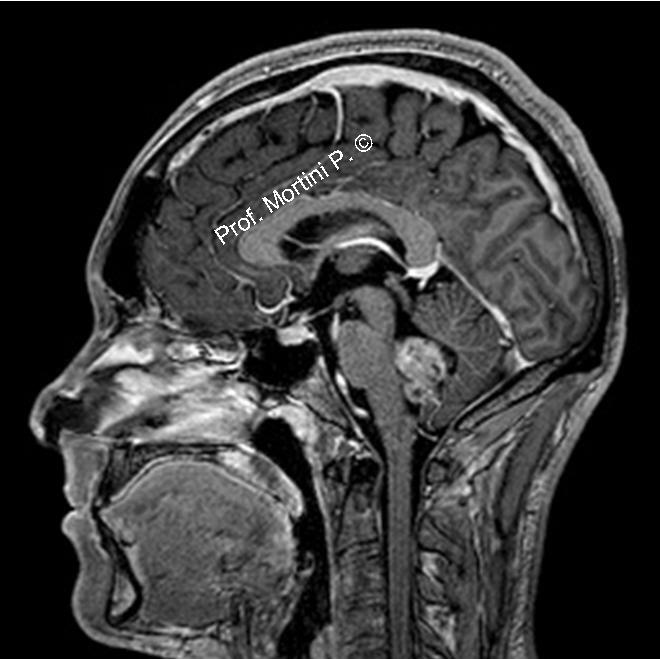 • Magnetic resonance imaging (MRI) scans primarily are used; this imaging test can show the size and characteristics of the tumor, as well as the presence of hydrocephalus. • Computed tomography (CT) scans also are used. For either study, an agent that provides contrast in the image is administered intravenously so neurological surgeons can visualize the tumor against the normal brain in the background. Medulloblastomas may be treated with surgery, radiation therapy, chemotherapy and sometimes, by implanting of a ventriculoperitoneal shunt. • The primary goal of surgery for a medulloblastomas is to remove as much tumor as possible and to restore the flow of CSF without producing neurological deficits. Surgery also provides tissue samples that can be used to obtain an accurate diagnosis. However, these tumors tend to spread, making total surgical removal of the tumor difficult and follow-up treatment a necessity. Several studies have recommended aggressive surgical resection followed closely by both radiation therapy and chemotherapy. • Radiation therapy, using high-energy x-rays or other types of radiation to kill tumor cells, is often used. Radiation therapy is not recommended for young developing brains and is avoided in children under the age of three. Radiation therapy, if needed, is technically very demanding and should be carried out in centers that have experience in that area to ensure optimal results. Clinical trials are studying ways of using chemotherapy to delay or reduce the need for radiation therapy in children younger than 2-3 years. • Ventriculoperitoneal shunt (also called a VP shunt): In approximately 30 percent of cases, the flow of CSF will not be returned to normal, and the child will require the implantation of a permanent shunt after surgery. The shunt is a type of tube that maintains a normal level of pressure inside the skull by draining excess cerebrospinal fluid from inside the brain to space in the abdomen.